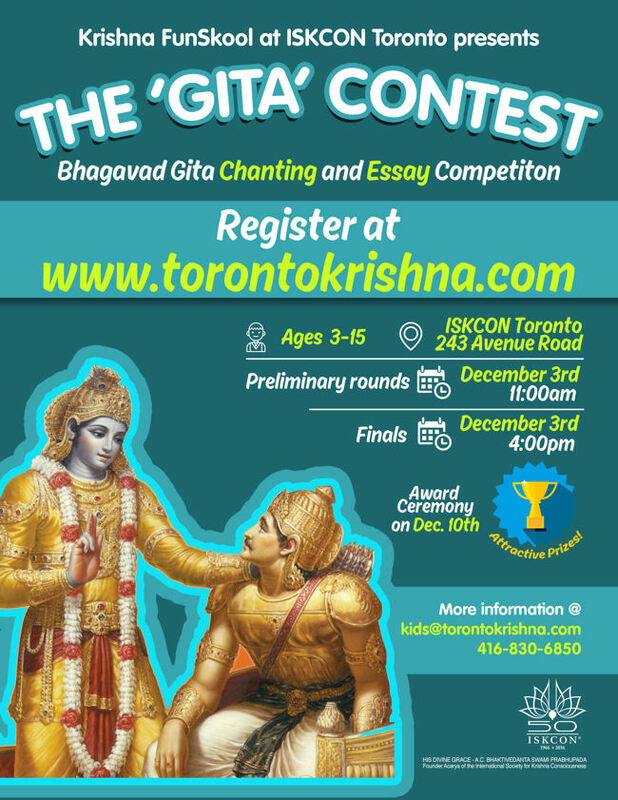 The Gita Contest - December 3, 2016 ~ The Toronto Hare Krishna Temple! 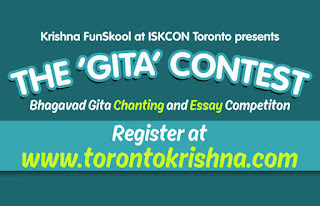 As part of the 50 years of ISKCON celebrations, Krishna’s Funskool of Toronto Hare Krishna Temple is pleased to announce the ‘Gita’ Contest – Bhagavad Gita Chanting and Essay writing competitions for children. Preliminary rounds: December 3rd – 11:00 a.m.
Finals: December 3rd – 4:00 p.m.
Award Ceremony: December 11th – 6:30 p.m. Please clarify, the verse recitation and translation is off of memory or they can read it aloud from notes? Please write to kids@torontokrishna.com for your questions related to the contest.